This week, I’m mostly catching up with new releases from the past several weeks where I had no posts. 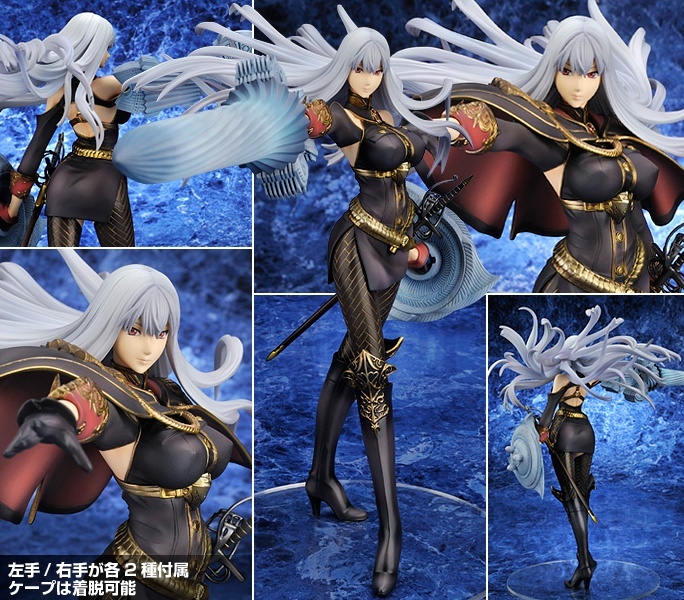 First up, we have a rare 1/7 scale figure from Alter featuring Valkyria Chronicles antagonist Selvaria Bles. There’s a lot to like here. Likable character from a good game, good pose and sculpt, detailed outfit and accessories, and larger than average scale. You could argue that Alter’s Selvaria looks borderline cheerful and therefore out of character, but I’m not particularly bothered by her expression and it wouldn’t stop me from getting the figure. Next up, we have another new Alter figure featuring fiery redhead Asuka from the Rebuild of Evangelion movies, who apparently changed her name when I wasn’t looking. I haven’t gotten around to watching any of the new (or even old) Evangelion movies–I’ve only seen the original TV series–but I have seen enough of the new artwork floating around the web to know that I like the new “test” plug suits, which you see Asuka sporting here. Very nice detail on this figure, particularly when compared to Kotobukiya’s Asuka (see below). 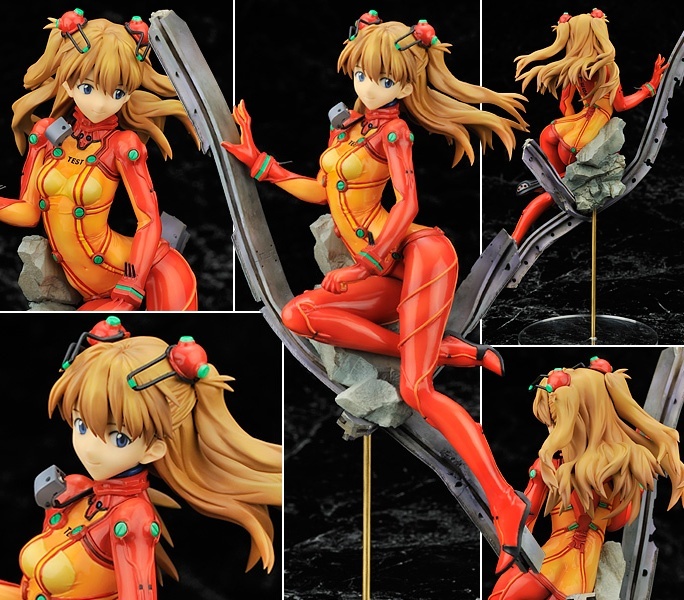 Just in time to compete with Alter, Kotobukiya has introduced their own test suit Asuka. Comparing the two, Alter’s version is clearly more detailed and arguably has greater overall visual appeal (pose, expression, etc.) than the Koto version. That said, I don’t see anything horribly wrong with Kotobukiya’s offering, so I wouldn’t fault anyone for picking it up. GSC’s Senjōgahara Hitagi will no doubt be one of the more anticipated figures of the year throughout the community. I know they had me hooked from the numerous tradeshow previews, which I recognized as a direct translation of this rather interesting piece of artwork from the series. 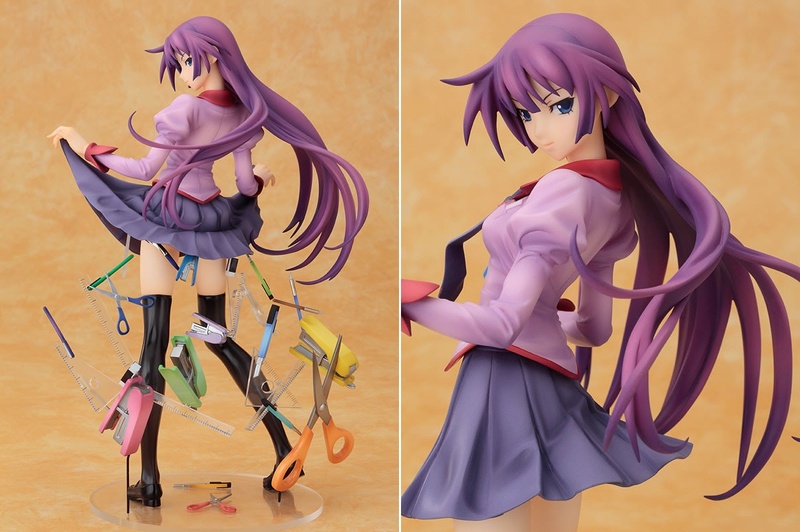 Honestly, I’m rather amazed that Good Smile Company even attempted to recreate the mass of office supply paraphernalia seen falling from under Hitagi’s skirt in the original artwork. But it seems they managed to do it, and the result actually looks pretty good. Overall, this is quite the awesome-looking figure and would be instant get material for me if I had more funds remaining for the year. 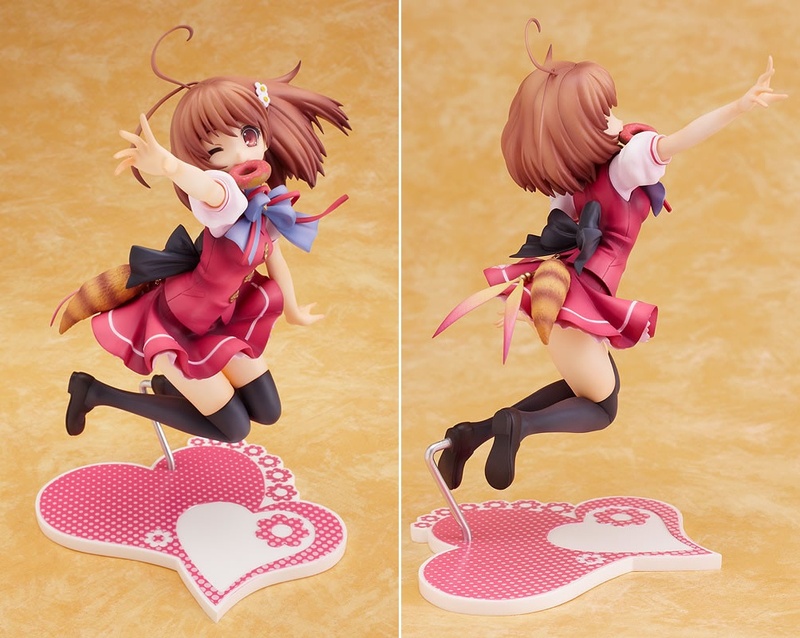 GSC’s Inaba Yui is another fine example of a figure I was almost certain I would get after seeing tradeshow coverage. Ms. Yui is the heroine of the Flyable Heart eroge, which features character designs from the awesome Noizi Ito. Yui oozes cuteness. The donut, the fox tail, the wink, the way she reaches out to the viewer… It’s all very smartly put together. I would definitely like to pick this figure up at some point. Here’s the last entry this year’s Shining Wind set from Max Factory. Not surprisingly, it’s Xecty in swimsuit form. It’s true that I badly wanted to see an Xecty figure come out of this venture from Max Factory, but I was really hoping at some point they would dive into some super-detailed figures featuring the normal costumes from the series rather than towing the line with the swimsuit treatment. I have to admit that I do really like the Clalaclan swimsuit version, so I guess it’s not a total loss. As for Xecty here, I think she’s probably the best entry in the series after Clalaclan, but probably not something I would pick up. This entry was posted in Figures, Previews and tagged 1/6 scale, 1/7 scale, 1/8 scale, Alter, Bakemonogatari, Flyable Heart, Good Smile Company, Inaba Yui, Kotobukiya, Max Factory, PVC, Rebuild of Evangelion, Selvaria Bles, Senjōgahara Hitagi, Shikinami Asuka Langley, Shining Wind, Valkyria Chronicles, Xecty Ein. Bookmark the permalink.